Back in January I joined crossfit. I didn't know much about it, other than you workout like crazy and their members tend to follow the paleo diet. After months of being confused by the jargon that accompanies crossfit and committing social suicide on the regular at classes, I've finally got the hang of it. Every few months my xfit gym does a paleo nutrition challenge and I decided to try it out since it was around my birthday and I wanted to slim down. It sucked alot for the first couple of weeks until I learned how to make paleo desserts...which I'll of course post later. Anyways, we were allowed to have protein shakes and bars as well as quinoa.. So this challenge was technically light-weight paleo. The results were good and I lost 5lbs and some body-fat and such within the 7 week challenge. Of course, I cheated here and there but still..I was pleased by my results. I'm now on a pseudo-paleo maintenance plan and it's been rough to get back on the horse. It does help when you come across good food that's approved for the challenge and with that..I've discovered Quest bars. I'm currently obsessed with the cinnamon roll and cookie dough flavors. I got mine at GNC, and with my gold membership a package of 12 was around $23. Yes, it's pricey but worth it when you want a treat without cheating and sacrificing your waistline. With all that's going on in the celebrity world, I know I've been slacking on the Working On My Fitness portion of the blog. I frequently visit, Tone It Up, because not only are the founders, Karena and Katrina, have bodies to die for, but they're always offering such encouraging words of support and make fitness fun! They have super easy and delicious healthy recipes that I try to cook up whenever I get the chance. Below is one of my favorites for lunch and/or dinner. I try to make these as often as possible to keep my on track of my weight-loss goals. I joined CrossFit earlier this year, and have learned quite a lot about Paleo and just other workouts. I'll be posting more in the future about all that! So, it's been a while since I've updated this portion of the blog. No, I didn't fall off the fitness bandwagon. I still attend my bootcamp and try to fit in extra cardio when I can on my own. Currently, I'm participating in my boot camp's weight loss challenge (you can stop laughing now). Eating right is hard for me, while working out isn't. What really gets me in the mood to go hard on the elliptical or stairmill is a really good workout playlist. You all should know by now how much I love hip-hop/rap music. Well, consider yourself forewarned because this playlist may be lightweight hoodratchet, but eclectic at the same time. My musical tastes are pretty much all over the place and it definitely shows in the list below. Lost in the World- Kanye West ***note: this song starts off slow but really picks up after the first 60 seconds. I've been getting into my bootcamp/CrossFit classes since August of 2010 and try to go at least twice a week. However, everyone knows when work gets in the way, working out gets very hard to fit in. I also try to eat healthy too. But considering my BFF is Sorry I Couldn't Make it to Your Party, those healthy eating habits sometimes fall by the wayside. I've scanned fitness and nutrition blogs, but came across this recipe for a breakfast smoothie on a....fashion blog! At first I was hesitant to try a smoothie with leafy greens instead of all-fruit, but it is actually pretty good! This was my first time ever having Kale and it's not bad. Remove kale leaves from their center stalk (I actually just bought the pre-cut Kale at Trader Joe's to make prep time faster). 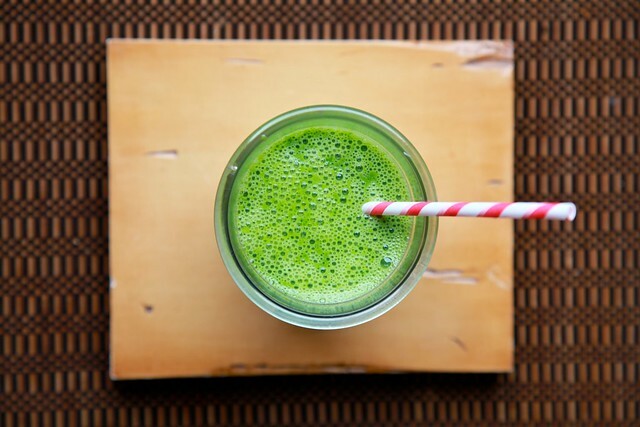 In a blender, combine kale spinach and almond milk. 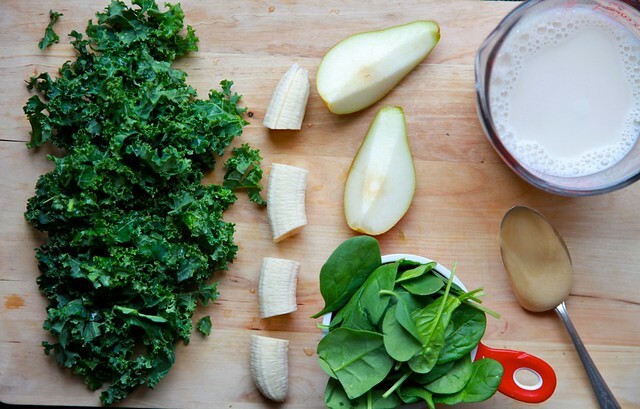 Blend until no big kale bits remain. Add banana honey and pear. Blend until smooth. Enjoy!